Straightness is probably the most difficult of the scales to place in terms of order. Although it is fifth on the scale, it is quite integral to achieving the earlier scales. In other words, the scales are all inter-related, and this is the most obvious example. Sound complicated? Try to think of straightness in the following terms to gain a better understanding. ‘Straightness’ is rather a misnomer, a better word to use is ‘alignment’. 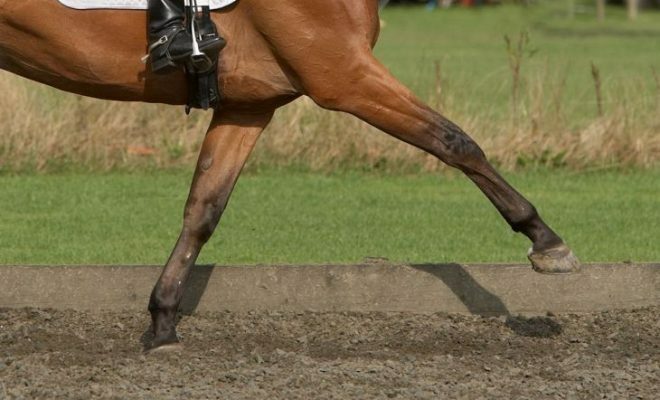 The forefeet must be aligned with the hind feet on straight and curved lines. The horse should have equal bend (and hence, alignment) on both reins. So you can see that this sounds a lot like the second item on the scale, suppleness. It is also integral to gaining equal contact in both hands, and developing impulsion, which depends on both hind legs thrusting with equal power and in the same direction. All horses are born crooked, and straightening them is a never-ending task; without monitoring, their natural crookedness will reassert itself. 1) Through developing even weight distribution on both sides of the horse, we help him to maintain health and soundness for ridden work, by promoting equal wear on the muscles, tendons, joints, and ligaments of both sides. 2) To prepare him for collection, the final scale. Only a straight horse using both hind legs equally and taking even weight in both sides of the contact can engage his hindquarters sufficiently under his body, assuming he is correctly supple over the top line and working ‘through’, to transfer more weight carriage to his rear end and so lighten his forehand to achieve true collection. When should straightness be addressed? Although straightness may not be a priority in the earlier stages, you need to start paying attention to it from the word go. Straightening natural crookedness takes months and years of persistent work, and although you may not achieve it until the horse is relatively advanced in training terms (around Medium level in British Dressage competition), you will need to work on it as an underlying issue pretty much as soon as your basic controls are established. “The horse is straight when its forehand is in line with its hindquarters, that is, when the longitudinal axis is in line with the straight or curved track it is following”. Absolute straightness is what you are trying to achieve on a center line. 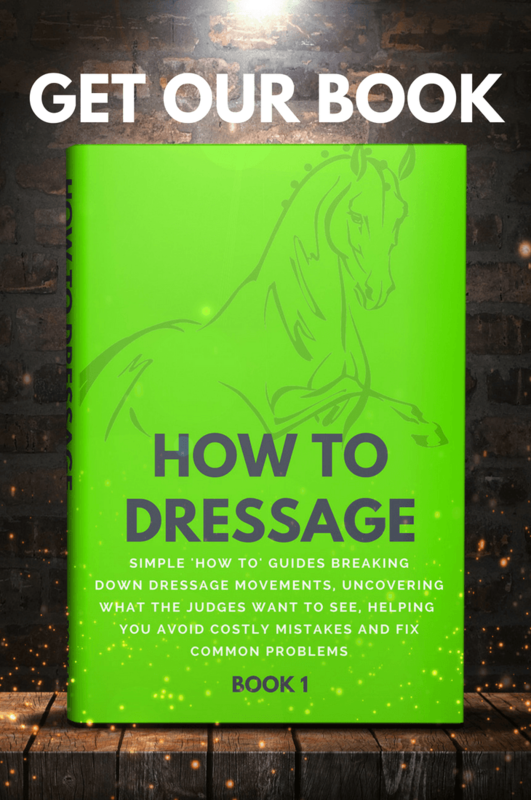 You want your horse’s spine to be totally aligned to the straight line along which you are riding, from his head, along his neck, along his back, and into his hindquarters and tail with no part of his body deviating off the line. As anyone who has ridden a dressage test can tell you, this is easier said than done, but that is your goal. Functional straightness needs a little more explanation. Your horse’s hips are wider than his shoulders. This means that if you riding on soft ground and you look at the imprint of his front and hind hooves, you will see that the front feet land on the ground slightly closer together than the hind feet, so although we talk about alignment as the front and hind hooves traveling in the same lines, this is not quite possible. Functional straightness describes when you have the two hooves (front and back of one side) traveling along the same line and is what you should strive to achieve in canter. As opposed to walk and trot, canter brings an added complication to straightness. Due to the nature of the canter sequence, where the legs on one side (the ‘leading’ side) are always moving in advance of the legs on the outside of the body, the horse’s spine is predisposed to curling up towards the leading leg. This is why judges often comment that a horse is ‘quarters in’ in canter. To prevent this natural crookedness, canter should always be ridden with a slight feeling of shoulder fore, so that the two feet on the leading side are aligned (in one track), and the horse’s nose is positioned above his inside knee. Remember that difference in the width of your horse’s shoulders and hips? Then you will see why you must move the shoulders slightly in to put the front hoof directly in front of the corresponding hind hoof. This is functional straightness. Although straightness is far along in the list of training scales, it must be addressed as soon as possible and refined when the other scales are established, rather than being ignored during the earlier stages of training. Straightness is essential if the horse is to complete the scales and achieve the goal of training, which is the ability to collect, i.e. redistribute the weight carriage of horse and rider more towards the haunches, to lighten and mobilise the forehand, removing the excess weight from the more vulnerable front leg joints, and so promote health and soundness.